Texas Comptroller Susan Combs on Tuesday defended a controversial program her office oversees to conserve the state's threatened dunes sagebrush lizard. 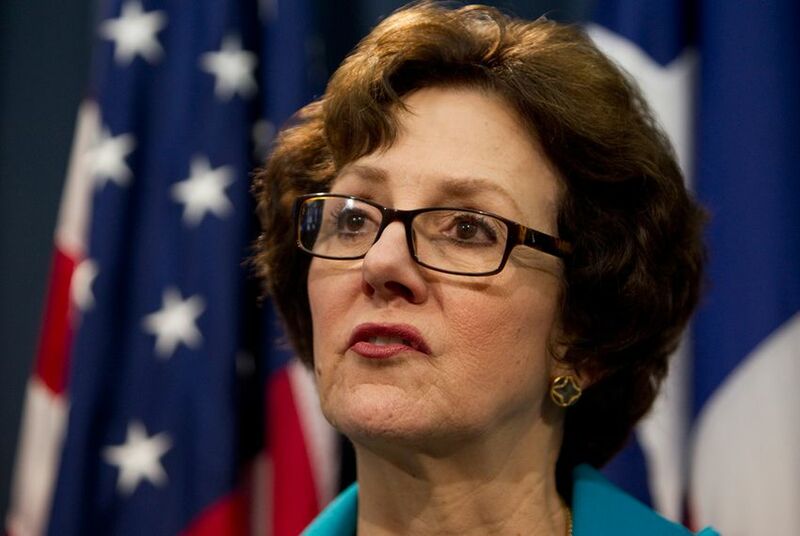 WASHINGTON – Texas Comptroller Susan Combs on Tuesday defended a controversial program her office oversees to conserve the state's threatened dunes sagebrush lizard. The program is intended to protect the land where the lizards live by paying landowners to conserve their property — using funds from oil and gas companies that operate in the Permian Basin. But Combs' office, which is using satellite imagery to monitor landowners participating in the conservation plan, is keeping further details of the program private. Combs’ office was given the authority to deal with endangered species, normally under the purview of the Texas Parks and Wildlife Department, after then-state Rep. Warren Chisum slipped an amendment into a fiscal bill in 2011. The bill was backed by oil and gas lobbyists; Chisum is now one himself. The dunes sagebrush lizard, which finds its home in Texas’ oil-rich Permian Basin, is one of many rare species that the U.S. Fish and Wildlife Service has considered listing as “threatened” or “endangered” in recent years. Combs said the conservation program her office operates is the reason the federal agency chose not to list the lizard. But the payment model is being questioned in court, and some groups have used satellite images to suggest it isn’t working. Two D.C.-based wildlife advocacy groups, Defenders of Wildlife and the Center for Biological Diversity, sued the U.S. Fish and Wildlife Service this summer over that decision; Defenders of Wildlife senior staff attorney Jason Rylander said the case is unlikely to be heard in court before the fall of 2014. While Rylander said satellite imaging can be useful, his organization worries about accountability. The comptroller's office "won’t reveal the landowner names or locations of land [in the program] so we don’t have confidence right now that the habitat is, in fact, being protected," he said. During the D.C. panel discussion, Combs advised other states on how to integrate economic and environmental policies. She emphasized preparation — knowing what might be “the next thing” on the list — and defended the satellite imagery. She said her office can see if private property owners who agreed to engage in conservation activities have done so — or if they have "added a new well pad they weren't entitled to." She added that she is required by law to maintain the confidentiality of landowners participating in the program. Many state lawmakers have expressed trepidation with the program. State Sen. Kel Seliger, R-Amarillo, backed a bill last session that would have streamlined the preservation of endangered species in Texas with an oversight board composed of representatives from state agencies, including the comptroller’s office. He said his bill would have established transparency that the current system lacks. While Seliger's bill passed in the House and the Senate, Gov. Rick Perry vetoed it. Combs said her role in protecting species stems from the economic effects of environmental decisions. “I want whatever produces the best biological impact with the least cost and with the biggest gain to the economy,” she said.